I’m not a religious person, but I make a point of visiting churches in just about every destination where I land. These buildings—some small and simple, some massive and grand—provide a great way to learn more about the history, architecture and art of a community. 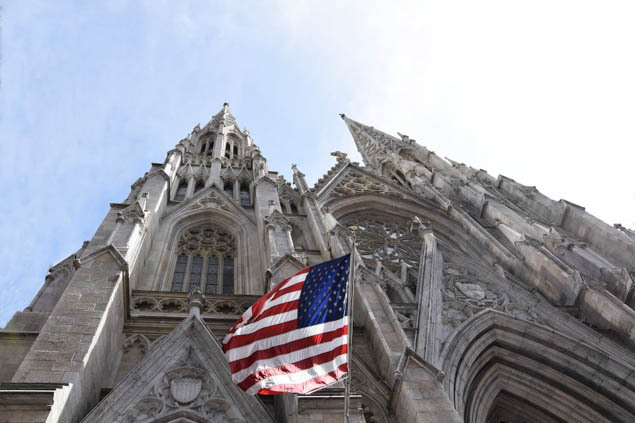 One of the most well known churches in the world, and with good reason, is St. Patrick’s Cathedral on Fifth Avenue in New York City. I think one of the most surprising facts about this amazing Gothic cathedral is that it was originally considered too far out of the city to be of much use—looking around today, you can tell that Archbishop Hughes, who spearheaded the project, had a vision that was years ahead of his detractors. Designed by James Renwick, the bronze doors on Fifth Avenue are an architectural feat of their own—each weighs 9,280 pounds, but are so well-balanced that they can be opened by a single person. While you could spend hours just looking at the carvings in the façade that feature holy men and women, the inside doesn’t disappoint; make sure to check out the 75 stained glass windows, ornate altars and two massive pipe organs, which attract more than 5 million visitors a year. You’d think you wouldn’t be impressed visiting more cathedrals in New York after seeing St. Patrick’s, but you’d be wrong. When you’re talking massive, you’re talking about St. John the Divine, located on Amsterdam Avenue, which at 601 feet in length is the largest cathedral in the world, and one of the five largest church buildings in the world. And it’s not even done yet. It’s hard to believe that the 120-year-old cathedral remains unfinished—how much bigger can it get? The dome over the crossing could fit the Statue of Liberty underneath—and no, I’m not making that up. Other items worth noting are the stained glass windows, which took approximately 30 years to fabricate and install, and the Great Rose Window, which at 40 feet in diameter, is the third largest rose window in the world, made of over 10,000 pieces of glass. Outside, make sure to stop by the Peace Fountain, a rather cataclysmic celebration of the triumph of good over evil, and don’t be surprised if you see a peacock or two walking by. John Pitcairn, one of the founders of Pittsburgh Plate Glass (PPG). The cathedral is located in the Bryn Athyn Historic District, which also includes Glencairn Museum, a seven-story medieval castle with a 100-foot tower that overlooks the cathedral and the Philadelphia skyline, as well as Cairnwood Estate, a Gilded Age, Beaux Arts mansion. What’s cool is that you can take guided tours of this National Historic Landmark District, which includes the Gothic and early Romanesque style cathedral building built between 1913 and 1928. The cathedral which is still in use today, was designed by Pitcairn’s son, Raymond, who wanted the hand-blown stained glass windows designed according to medieval techniques. To this end, he had a 12th-century manuscript translated for the glass artisans to follow, and also sent them to England and France to see examples of the lost art of pot metal glassmaking. It’s hard to believe, but this Romanesque-style chapel, located in Troy Hill, houses the largest collection of publicly venerable Christian relics outside the Vatican. More than 5,000 of these relics, which include the skull of St. Macarius of Egypt, the bones of St. Demetrius, the tooth of St. Anthony of Padua and 14 pieces of the True Cross, are on display as a result of Father Suitbert Mollinger, who used family money to buy them when they became available as the result of political upheaval in Europe in the 1800s. An area known as The Shrine of the Saints houses almost all of Fr. Mollinger’s relic collection, and an annex includes life-sized Stations of the Cross. The chapel offers docent-led tours on weekends, as well as an audio tour that can be accessed by smartphone at other times. Do you have a favorite church or cathedral to visit? Tell us about it on Twitter! There is a lot of magic in Christmas travel, especially in these fantastic locations. Enjoy these creative ways to experience Denver. Freelance writer. Road tripper. Travel diva. Dog rescuer. Writes for food or kibbles and bits. Based out of Pittsburgh, PA, via Juneau, AK, Vanessa has been a freelance writer for more than 25 years, and has been published in many diverse publications,including GEEK, Recreation News, CATS, VFW magazine, the Antique Trader and more. An avid traveler, she always brings home amazing memories...and often more dogs. Follow Vanessa on her blog, Mood Swings and Other Things, on Twitter, Facebook, Pinterest, or Instagram.